Heat oven to 350°F. Unroll dough; separate crosswise into 2 sections. Press each section into 6-inch square, firmly pressing perforations to seal. 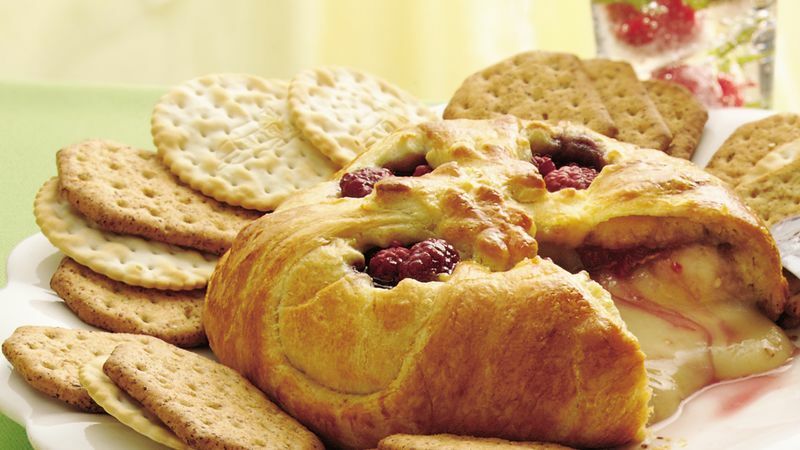 Place cheese on center of 1 dough square; top with jam and raspberries. With small cookie or canapé cutter, cut 1 shape from each corner of remaining dough square, 1 inch from center of square; set cutouts aside. Place square on top of cheese round. Press dough evenly around cheese, folding bottom edges over top edges; press to seal completely. Place on cookie sheet. Brush dough with beaten egg. Arrange dough cutouts on top; brush with egg. Bake 25 to 30 minutes or until golden brown. Remove from cookie sheet; place on serving plate. Cool 10 minutes. Serve warm with crackers. Store in refrigerator. If the raspberries are tart, sprinkle them with 1/4 teaspoon sugar before placing them on the cheese.